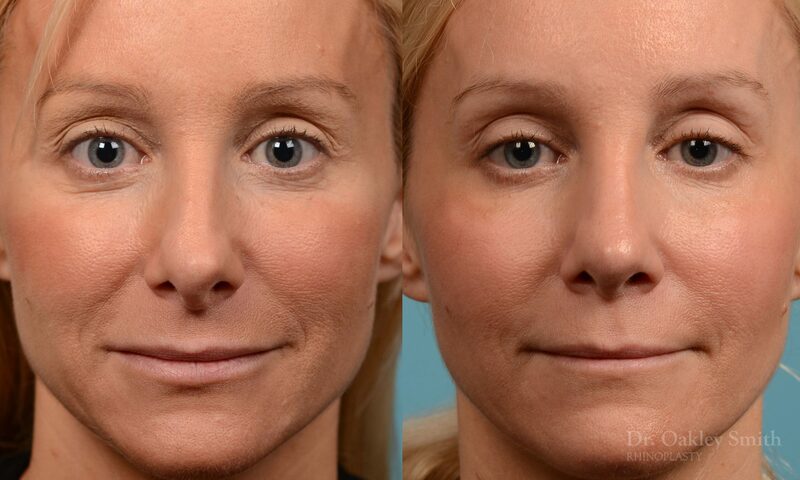 At ten years of age, this pleasant middle aged female from Toronto fell and broke her nose. She had a reduction of her broken nasal bones immediately after, however this wasn’t successful and her nose remained crooked, hooked and blocked. 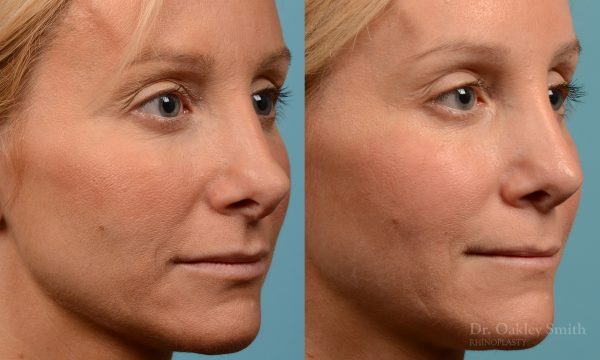 Ten years ago she underwent a rhinoplasty which unfortunately failed. Two years later she had a revision rhinoplasty. 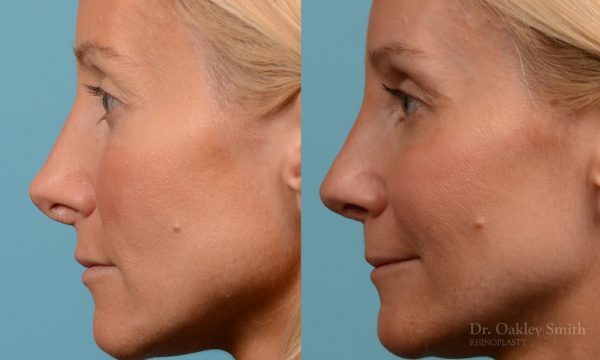 She recalls the surgeon who, at the time, was an experienced and well known rhinoplasty surgeon, spent five hours trying to repair her nose. 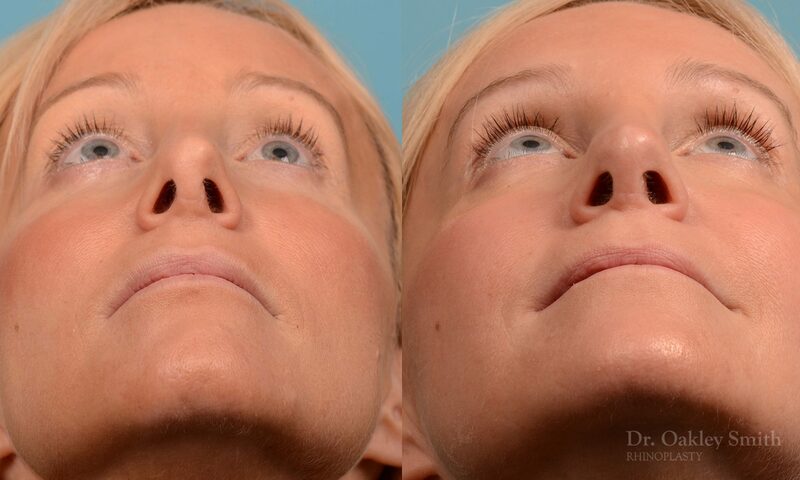 The surgery restored her nasal breathing, but she was left with a crooked bridge, droopy or hanging columella and a knuckled nasal tip, all which she disliked as she felt it gave her a ‘worked on’ or fake appearance. 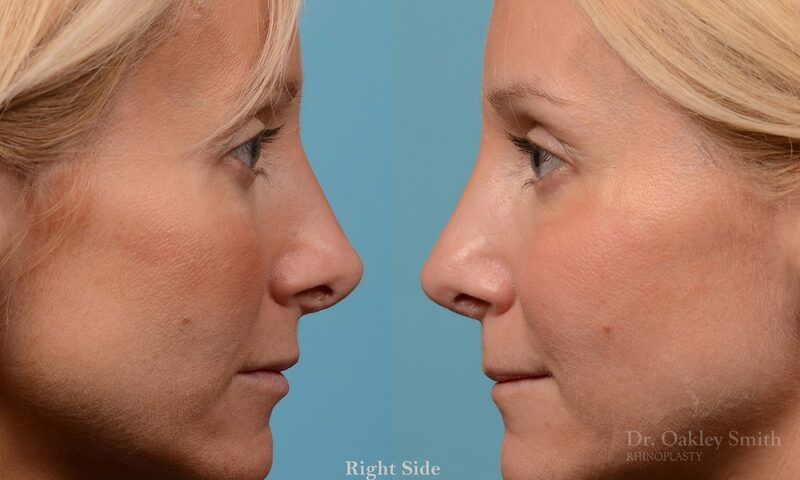 Revision rhinoplasty means the surgeon is working with disturbed and usually damaged tissues. This often reduces the options and thereby also negatively affects the outcomes. Goals have to be more limited and expectations unfortunately usually need to be reduced. Here, there is clear improvement. The hanging abnormal appearing columella has been significantly improved yet it could still be better. The asymmetries of her tip, best seen on the 3/4 views, are much better but could be there. Small imperfections can still be seen on her side. Her up turned perky tip has been replaced with a normal appearing profile. This revision rhinoplasty is not the typical revision surgery. Here the rhinoplasty was still predominantly a reduction rhinoplasty like the vast majority of primary rhinoplasties, while most revision rhinoplasties are augmentation surgery as their first surgery over-resected the nasal structures. 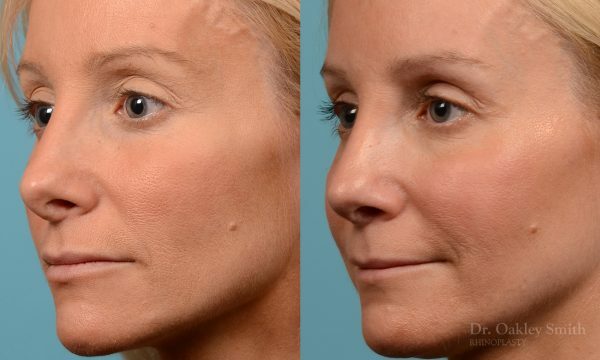 Dr Oakley Smith has a significant experience with revision rhinoplasty as he sees revision patients from across Canada and is referred revision patients from many of his surgical colleagues.